A New Powerup –The Hero Cape! This brand new powerup will bestow your Sackboy or Sackgirl with the ability to glide long distances and perform incredible aerial acrobatics that even Batman would be proud of! The DC Comics Premium Level Pack comes with 7 Trophies and 50 Pins to earn for completing the most heroic of deeds on LittleBigPlanet. This seems like only the first of 6 level packs coming from DC Comics and they can either be purchased separately or all together as a season pass, which will save you some money. 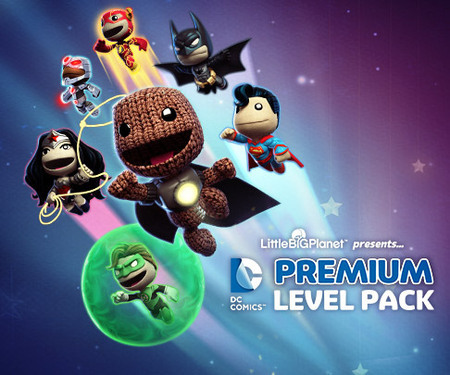 For more information on the new DC Comics Premium Level Pack, check out the official LittleBigPlanet post here. And that hero is you! It’s time for your Sackboy or Sackgirl to put on their best superhero costume and head off for a whole new adventure! ©2010 Sony Computer Entertainment Europe. LittleBigPlanet is a trademark of Sony Computer Entertainment Europe. Developed by Media Molecule.